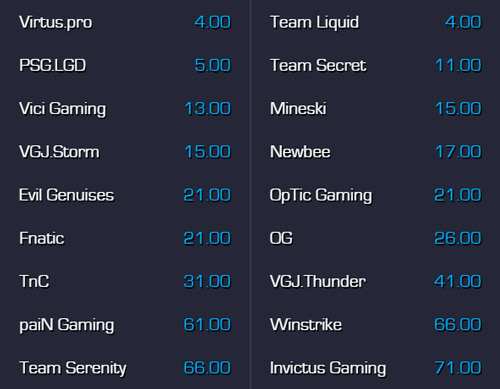 TI8 is just around the corner and, finally, we have some concrete betting odds already available coming from the most popular eSports bookies at the moment. Of course, this is not a surprising fact considering The International 2018 is the world's most popular eSports event. The biggest paying one too, but I suppose everyone knows that already. It goes without question that this tournament is sort of like the World Cup of eSports. Millions of fans will tune in to watch the spectacle… with millions of dollars on the line and nothing but cold hard pride to battle for, players will surely give their best to emerge victorious. 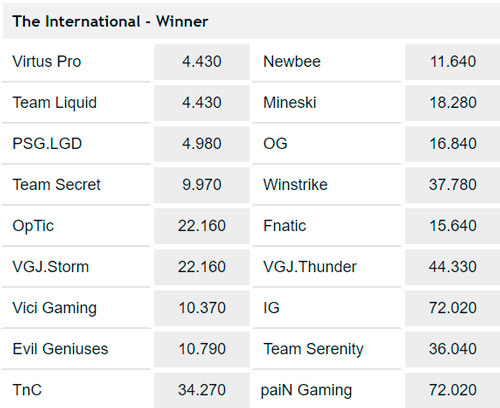 Add to that a ton of eSports betting enthusiasts who demand only the optimal The International 2018 betting odds and you'll realize why this article exists… to tell you more about them! 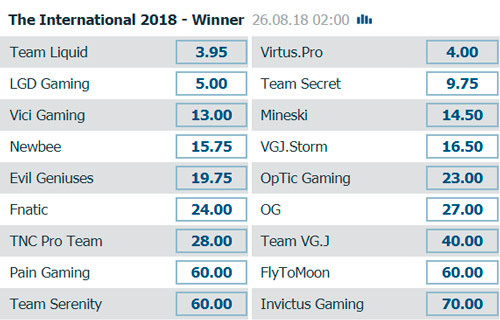 Of course, the most prominent The International 2018 betting odds option now available is the Outright Winner. This bet functions in a rather simple way – you bet on a certain team that you believe will win the tournament. If your choice is correct, your slip is a winning one. There's also a slight variation on the Outright Winner betting option called To Reach The Final. The story goes somewhat similarly – you bet on a certain team that you believe will reach the finals. This means, no matter the outcome of the finals, if the team you chose plays in it, your betting slip is a win. This is another very popular betting option that differentiates quite a lot from the first two. Instead of picking between a single team, Region of Winner betting options allows you to choose an entire region from which you think the winner will be. Yes, the chances of getting this bet right are far superior to the likes of Outright Winner… but they're usually quite smaller too. 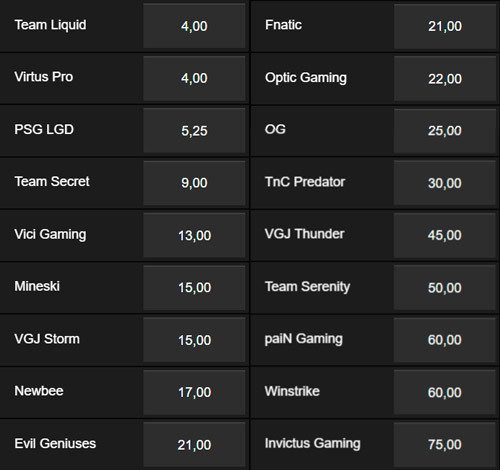 Below you can find the current odds on the best esports betting websites out there. Last year out, Valve has released wagering for all battle pass owners. It's not your typical betting since it involves around weekly received tokens. Battle Pass owners can bet up to 1000 of their tokens per week, doubling the bet amount for every correctly placed bet. Yes, this means they can accumulate up to 2000 battle points per week if their predictions are successful. It takes 1000 battle points to gain a level which then gradually unlocks various cosmetic in-game items.